Too have clean carpet you have to keep your carpet clean. Part of keeping your carpet clean is to vacuum at least twice a week. Also make sure once a month you move what you can and vacuum under anything you can move also vacuum edges so you don't end up with a dark edge.You should have your carpet steam cleaned once a year if you have allergies maybe even twice. 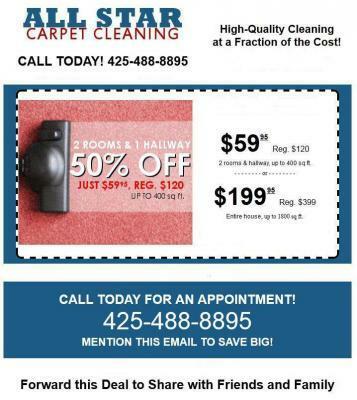 Carpet Cleaning in Marysville ,Wa. happens everyday we clean carpet in Marysville all the time. All Star Carpet Cleaning uses high powered truck mounted steam cleaning machines. Hot water extraction is the best way to get allergiens and all kinds of fine dust you can't see. All Star Carpet Cleaning takes pride in everything we do if for any reason you are not satisfied we will reclean for free.